Retro entertainer Charles Phoenix puts a red, white, and blue spin on his superstar sweet. 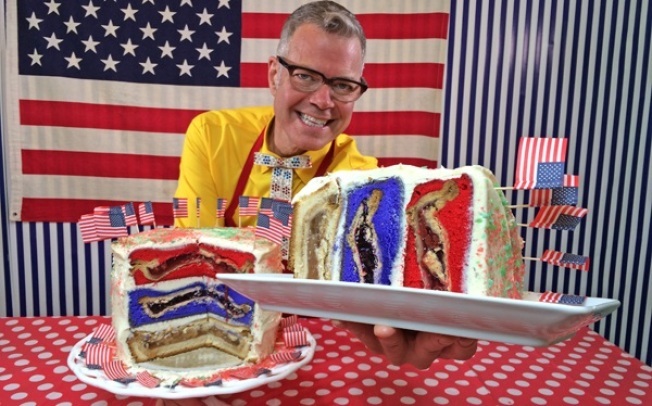 Charles Phoenix, the LA-based inventor of The Cherpumple, has created an Independence Day version of his pies-inside-cakes dessert. Name: The Cherbluble. It matters not if the Thanksgiving celebration you attend boasts elaborate decorations or a huge chrysanthemum centerpiece or the best mashed potatoes or the liveliest company: If you walk in with a homemade Cherpumple, you and your monster-mash dessert will be the talk of the party. The Cherpumple, a made-in-LA meal-ender created by retro-tastic entertainer Charles Phoenix, is a sweet that's reached far beyond Southern California's borders, and with fine reason. It is a towering wonder, a symphony of flavors, three different pies baked inside three different cakes. Now Mr. Phoenix has gone patriotic in the kitchen, and any Fourth of July revelers looking for an extra splashy dessert to haul to the neighborhood barbecue will benefit. Meet the Cherbluble, a colorful cousin to the Cherpumple, a treat that basically takes the zany principles of the original dessert and adds some red, white, and blue flair. And while pumpkin pie is a staple of the Cherpumple, a colder weather dessert, you won't find it here; rather look for cherry, apple, and blueberry, a fairly faithful rendering of red, white, and blue, if you count the whiter insides of the apples. Get it? Cher=cherry, blub=blueberry, le=apple. Cherbluble! Say it three times fast. Some white cake and red and blue food coloring make the non-pie parts of the oversized sweet stand out, visually. Pop Rocks in blue and red are also recommended to round out the vibe of the dessert, if you want to walk that route. And, really, once you've said yes to making the Cherbluble, you're gonna go there. Mr. Phoenix advises that this cake-pie creation possesses superpowers and will attempt to rule any cook that takes it on. Best embolden yourself for the task by reading his warm warnings. And best get reading for the oohs and aahs and what in the heck is that's? 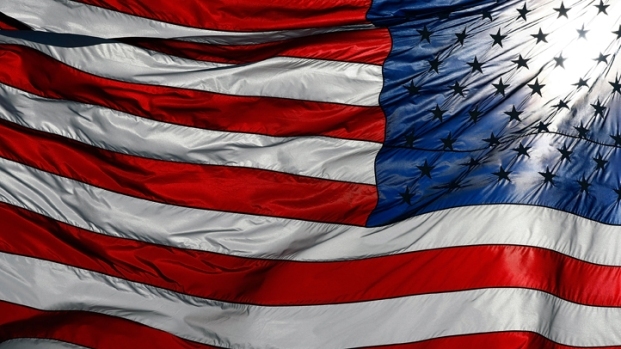 that you'll hear upon entering the backyard barbecue on the Fourth of July. Sure, you could show with a tub of ice cream it took you 90 seconds to buy, or you could astound people with a weird and tasty tribute to our country's birthday. Yes, astound. The Cherbluble, like its cousin the Cherpumple, does rock some mighty superpowers. No tall buildings shall be leapt but chins are sure to drop at the sight of it. Your recipe is here, brave bakers.